Famous Wisconsin Mixed Cheese Curds & Mild Sausage Sticks Pack. 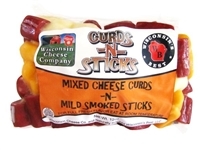 A great combination of Yellow and White Cheddar Wisconsin cheese curds with a fusion of naturally smoked mild sausage snack sticks. This mouth watering combination is great for any occasion! Manufacture-Wholesale information Contact us for product cost and minimums. Famous Wisconsin Garlic Dill Cheese Curds n Mild Sausage Sticks Packs. Blended with Dill and Garlic throughout each curd with a fusion of naturally smoked mild sausage snack sticks. 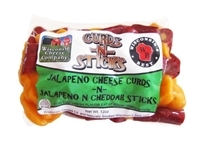 Famous Wisconsin Jalapeno Cheese Curds n Jalapeno Cheddar Sticks Pack. If you like it "Hot" these curds and snack bites are for you! This mouth watering snack is perfect for any occasion!